Currently we make more than 24 different Tailgate Locks to fit most trucks. They include manual locks that blend in with the handle; chrome locks, that dress up the truck's appearance and power locks, that mount out of sight inside the tailgate and operate at the touch of the remote. 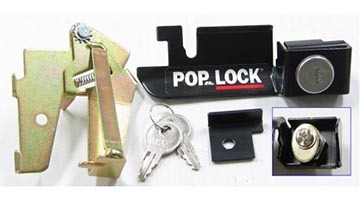 Pop & Lock protects the contents inside a tonneau cover or camper top and also guards against the theft of the tailgate itself, the tail lights or a bed extender. 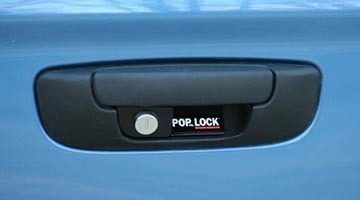 POP & LOCK is the only tailgate lock that requires no truck modification. Just install the POP & LOCK, turn the key and lock. Simple, effective security against tailgate theft. Maximum Security - Made of armored steel. Mounts over the plastic bezel so that it cannot be popped out. 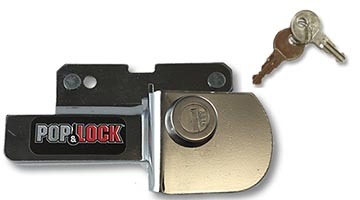 Fast Key Replacement - Key Code is stamped on the face of the lock for easy key replacement.